Exiled in Paris, the frail, elderly Mathilde Kschessinska sits down to write her memoirs. A lifetime ago, she was the vain, ambitious, impossibly charming prima ballerina assoluta of the tsar's Russian Imperial Ballet in St. Petersburg. Kschessinska's riveting storytelling soon thrusts us into a world lost to time: that great intersection of the Russian court and the Russian theater. Through Kschessinska's memories of her own triumphs and defeats, we witness the stories that changed history, from the seething beginnings of revolution to the end of a grand, decadent way of life that belonged to the nineteenth century. 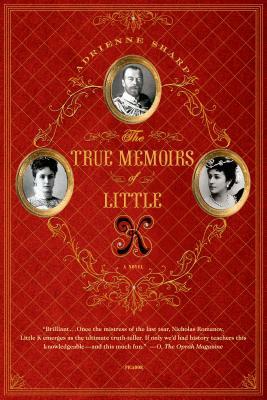 Based on fact, Adrienne Sharp's The True Memoirs of Little K is "an engrossing tale of love, loss, and history" (The Wichita Eagle). Adrienne Sharp entered the world of ballet at age seven and trained at the prestigious Harkness Ballet in New York. She received her M.A. with honors from the Writing Seminars at the Johns Hopkins University and was awarded a Henry Hoyns Fellowship at the University of Virginia. She has been a fiction fellow at MacDowell, the Virginia Center for the Creative Arts, and the Squaw Valley Writer’s Conference. She is the author of The True Memoirs of Little K, White Swan, Black Swan and The Sleeping Beauty. The novel’s title claims these are Mathilde’s true memoirs. Is any memoir entirely true? What aspects of his or her life might a memoirist attempt to conceal—or rewrite? What is illuminating about reading a fictionalized account of someone’s life as opposed to an autobiography or a biography? In what ways did Mathilde’s affair with Nicholas give her both more power and less? Consider her position both in the theater and in society. How did this affair empower her or limit her in these realms? How did other prominent women, such as the empress dowager, the empress, and the wife of Grand Duke Vladimir, exert power in a society that denied official status to women? The love between Nicholas and Mathilde was affected from the start by the knowledge that they could never be husband and wife. How did this knowledge define their relationship early on, and how did their expectations of each other change over time as their relationship continued? How does Alix’s experience of mothering the frail Alexei mirror Mathilde’s experience as a mother? In what ways does this suffocating mothering infantilize both boys? Was it this—or the disruption of the revolution—that tied Mathilde to her son, who remained her caregiver later in life instead of marrying and creating a life of his own? How might Alexei’s relationship with his mother, had he lived, have mirrored that of Vova? What do Vova’s father figures teach him about being a man and being a leader? When both Sergei and Nicholas encourage him to impersonate the tsarevich, what does this promise him? How is Vova’s attitude about himself irrevocably shaped by this impersonation and by his induction into the imperial family in the latter part of the novel? Under the Romanovs, the art of ballet experienced its greatest flowering. What circumstances contributed to this? Consider the wealth of the Romanovs; the interconnection between the various theaters, schools, and conservatories in St. Petersburg, and therefore between composers, choreographers, set designers, and the theater, opera, and ballet; and the social relationships between the court and the theater. In what ways did being the daughter of an Honored Artist of the Imperial Theater’s benefit Mathilde? What pressures did it exert on both her and her siblings? What were Mathilde’s strengths and weaknesses on the stage? Discuss Rasputin’s role in the Romanov family. Why did Alix obstinately ignore the furor that surrounded Rasputin, a furor that became one of the incendiary factors in the people’s anger against their sovereigns? In what ways did Rasputin’s murder foreshadow the revolution and the strike at the crown two months later? What advantage does Mathilde have over Nicholas, imprisoned at Tsarskoye Selo, when she makes her decision to retrieve her son before the family is moved to Siberia? What future does Nicholas envision for himself and his family at that point, the summer of 1917—and what future does Mathilde see ahead for them? Which of Mathilde’s history lessons surprised you the most? What aspects of the Russian revolution had you been unaware of? Was a violent revolution, resulting in a brutal police state, the only way the suffering of the lower classes could have been resolved in that society? What kept the Romanovs, and members of their circle such as Mathilde, from addressing the demands for change that came from all levels of society—from the workers, the peasants, the intelligentsia, even from members of the aristocracy itself? Sergei was one of the dozens of Romanovs who did not survive the revolution, along with many other members of the aristocracy and the bourgeoisie. What does The True Memoirs of Little K reveal about the nature of survival? Once Mathilde and the Romanovs find themselves in exile, they attempt to re-create their former lives—but the rules that formerly governed that society have loosened, enabling Mathilde’s marriage to Andrei. What did each of them gain from this marriage—and in what ways did it help to legitimize Vova’s place in Russian society in exile? How effectively were Vova and his parents able to establish a place for their son? In 2008, DNA evidence confirmed that no members of Tsar Nicholas’s immediate family escaped execution by the Bolsheviks. In fact, Sokolov’s theories about how the imperial family’s bodies were burned to ash were found not to be true. How might Mathilde’s dreams of the imperial family be changed if she knew their bones lay in the mud beneath a wooden bridge in the forest near Ekaterinburg? If she knew their bones had been returned to St. Petersburg and interred in the tombs at Peter and Paul? In the novel’s closing pages, Mathilde is proud that her name appears in the genealogy charts of European and Russian royalty, though she expresses disappointment that her name is not included next to Nicholas’s and that her son’s name does not appear at all. Does she, after all, find the sacrifices she made and her exclusion from a place in normal society and normal family life worth this status?